Angela Murphy, senior marketing management major from Canfield, meets with Matthew Veneskey, senior analyst, and Nick Volinchak, assistant quality control manager, from Sage Data Services to discuss employment opportunities. The Williamson College of Business Administration at Youngstown State University hosts the semi-annual WCBA Meet the Employers Day 1 to 4 p.m. Wednesday, Sept. 23 in the atrium of Williamson Hall on the YSU campus. 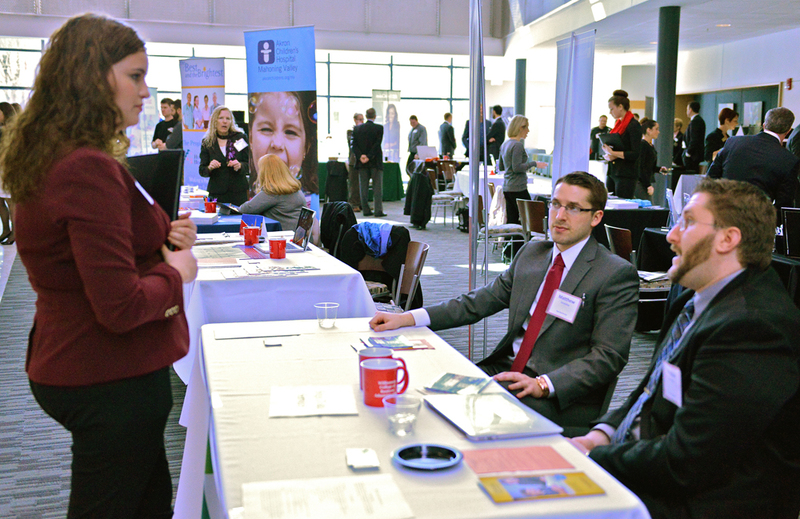 Employers will interact with business students one-on-one to discuss their organizations and identify future talent for internships, co-ops and full-time positions. Employers will also have the opportunity to connect with business faculty during the WCBA Employer Lunch at noon. Meet the Employers Day is free of charge. For more information, call 330-941-3660.